"We welcome your investigation, officer. We have nothing to hide." 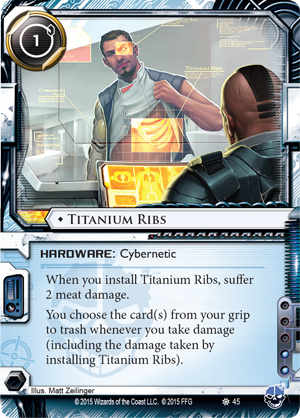 Skulljacks, titanium ribs, brain cages, and net-ready eyes – the latest trends in chromewear are now available at your local retailer and online through our webstore in Chrome City, the third Data Pack in the SanSan Cycle for Android: Netrunner! With its sixty new cards (three copies each of twenty different cards), Chrome City immerses you in the northern SanSan burough of the same name and its chromehead culture, where a growing number of fashion-forward citizens, including some of the world's best runners, are heading to their local chop shops for cybernetic upgrades. 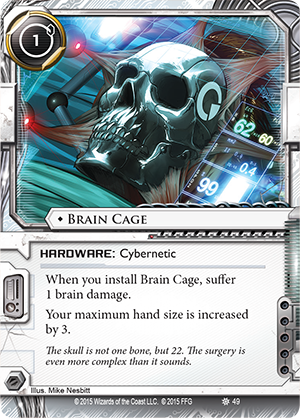 For many of these people, their entry into the chromehead culture begins with a medically-recommended cybernetic enhancement, intended to replace a limb or organ damaged through violence, an accident, or as the result of a genetic defect. Some try to hide their replacements or make them appear part of their physical body, but increasingly, these cyborgs view the adoption of new implants as a chance to flaunt their personal style. 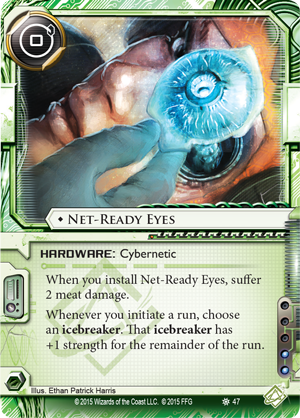 However, these cybernetics upgrades aren't just for looks. 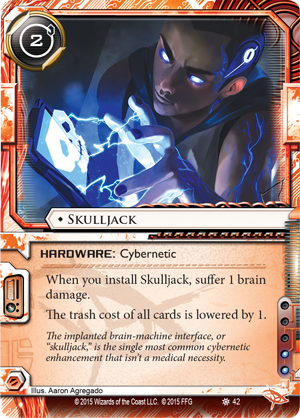 Your basic Skulljack (Chrome City, 42) is such a potent brain-machine interface that it has become the single most common cybernetic enhancement that isn't medically necessary. Meanwhile, Titanium Ribs (Chrome City, 45) and Brain Cages (Chrome City, 49) provide a measure of security to anyone working in a high-risk industry, and you'll find a small, but growing, elite subgroup of the hacker community looking to find new advantages in their cyberstruggles by upgrading themselves with Net-Ready Eyes (Chrome City, 47). Still, there would be no chromehead community were it not for those corporations that design and manufacture the cybernetics the chromeheads wear. 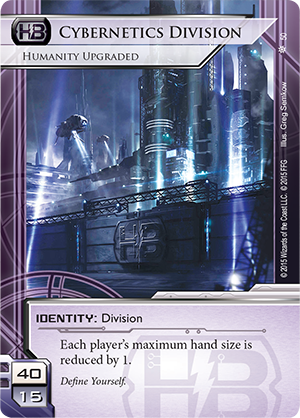 Accordingly, Chrome City celebrates the Haas-Bioroid faction with the new Cybernetics Division (Chrome City, 50) identity, as well as an agenda, a new piece of ice, and two upgrades. Not everyone in Chrome City is invested in cybernetics. 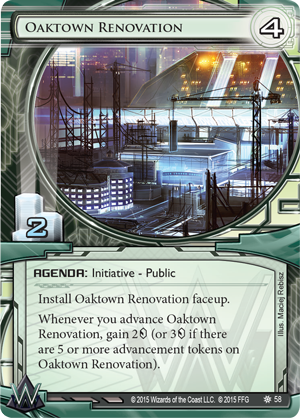 While Haas-Bioroid and the game's runners are busy exploring new cybernetics technologies, the Weyland Consortium is focused, instead, on its Oaktown Renovation initiative (Chrome City, 58). 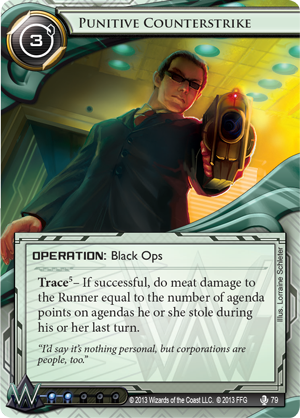 The first of a limited number of Corp cards from the SanSan Cycle that install faceup, Oaktown Renovation plays against one of the game's most basic elements – the Corporation's control of hidden information. 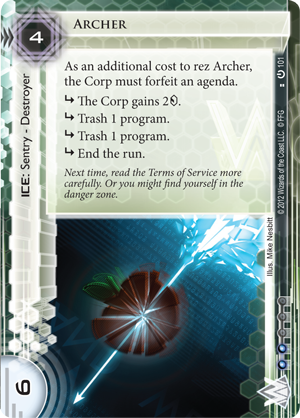 Normally, the Corp installs its cards facedown. Thus, if it installs a card into a server and spends two clicks and two credits to advance it twice, the Runner has to guess: is it an agenda? Or is it an ambush? 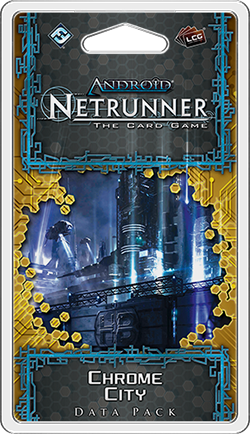 When the identities of the cards in and protecting its servers are hidden, the Corp can bluff the Runner. When the identities of those cards are revealed, the opportunity to bluff is removed. So why would you want to play with an agenda that you install faceup? For starters, Oaktown Renovation comes with an ability that you trigger each time you advance it. Whenever you advance Oaktown Renovation, you gain credits. The amount varies depending on how many advancement counters you have on the agenda, but the essence is the same: Instead of spending money to advance your agenda, you can advance your agenda to make money. 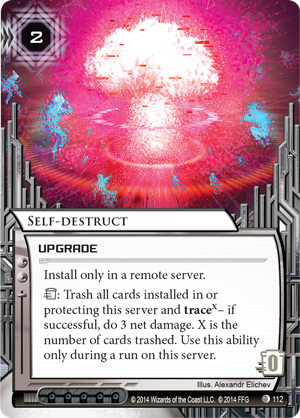 This is good because it plays into the real purpose for the card. It's bait. The Runner can't afford to let you make a fortune from your agenda, only to score it when you wish. 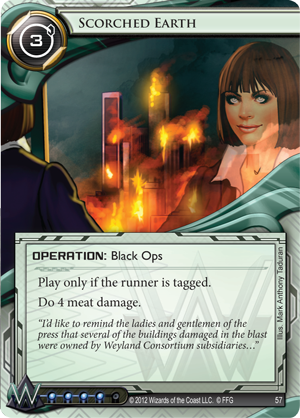 But the Weyland Consortium, more than any other Corporation, has demonstrated its willingness to sacrifice an agenda point or three, now and again, in order to lure out Runners and hit them with Punitive Counterstrikes (True Colors, 79) or to use SEA Source (Core Set, 86) to tag them before following up with Scorched Earth (Core Set, 99) to put them into bodybags. 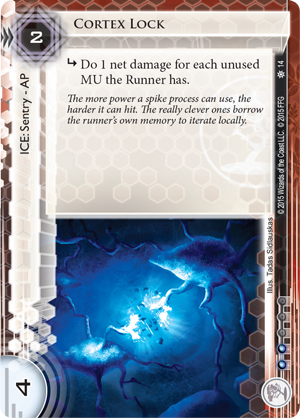 Even if you don't have these cards in your hand, or even in your deck, you might still be able to use your Oaktown Renovation as bait to lure an unprepared Runner into a nasty piece of ice like Archer (Core Set, 101), Cortex Lock (The Valley, 14), or Komainu (Honor and Profit, 17), and then you might still be able to keep your agenda out of the Runner's reach by blowing it up, along with everything else in the server, with a Self-destruct (The Source, 112) that can trace him and deal three net damage. 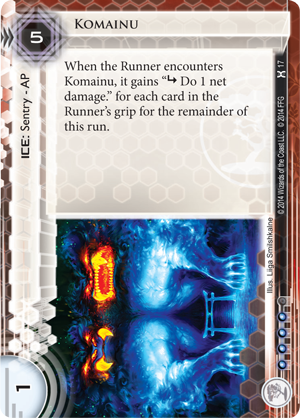 Of course, the Runner likely understands this as well, and that means if you start advancing a copy of Oaktown Renovation behind a piece of ice, he might decide his best bet is to just leave it alone. But then you can just score it… or advance it over and over again until you're as rich as, well, the Weyland Consortium. Thus, in the end, even though everything appears outwardly to be on the up-and-up when you advance your Oaktown Renovation, you might still be bluffing after all. Get a brain cage and play new mind games. 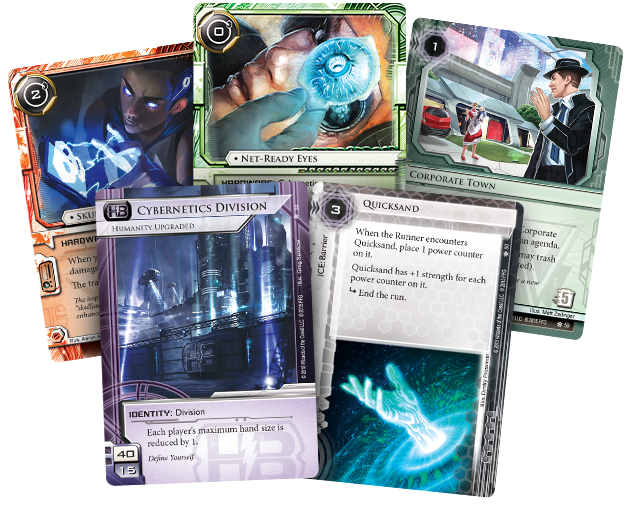 With its new cybernetics and faceup agenda, Chrome City introduces a wealth of new resources and tactics (even bluffs) to your games of Android: Netrunner. 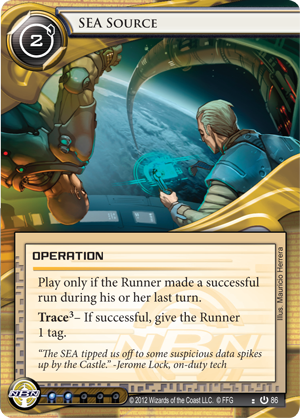 This third Data Pack in the SanSan Cycle is now available at your local retailer. Pick up your copy today!